Andreevsky Spusk is one of the oldest streets in Kiev. In ancient days it was the shortest way from the Upper Town to the Podol, or the Lower Town, where merchants and craftspeople used to live. Nowadays this steep and meandering street is a traditional place for arranging concerts, art festivals and city holidays. On Andreevsky Spusk there are many interesting picture galleries and souvenir stores. This street is often called Kiev's Montmartre, as any time one can see here artists displaying their works. It is also the place where singers and actors give their performances. came to Kiev and placed a cross on the site where Andreevskaya Church now stands, the sea receded, and only some water remained under the Andreevskaya Mountain. When the church was built, a spring appeared under the altar. That's why Andreevskaya Church doesn't have bells. The legend says that the sound of bells would awake sleeping water, and Kiev would be overflowed. 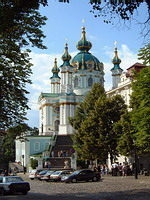 Andreevskaya Church was built by order of Russian Empress Elizabeth who intended to make Kiev her summer residence. The Empress herself founded the church and entrusted architect Bartholomeo Rastrelli to construct it. In 1749-1754 the construction was carried out under guidance of Ivan Michurin, an architect from Moscow. Andreevskaya Church is the perfect example of baroque style: it features efficiency, magnificence, plenty of gold and rich decoration. Expressiveness and eccentricity make Andreevskaya Church one of the masterpieces of native architecture of the 18 century. Among its sacred objects is a part of Saint Andrew relics that was delivered from Italy and now is kept in precious shrine. Pilgrims also value the Gospel in diamond setting that was presented to the church by Emperor Alexander. A picturesque terrace stretches around the church. It is said that famous writer Nikolay Gogol adored the surroundings of Andreevskaya Church and enjoyed walking along his favorite places. Andreevsky Spusk is closely connected with the name of one more writer, Mikhail Bulgakov. He lived in the house number3 in 1906-1916 and 1918-1919. In this house nowadays there is a Museum of Bulgakov. The neighboring house number 15 surprises with unusual architecture. Among the citizens of Kiev this house is known as "Richard's Castle", as it is shaped as a medieval castle. On the right side of this house there are stairs that lead to the sight place offering a splendid view on Podol, Dnepr and its bridges, as well as houses of the left bank. On Andreevsky Spusk there is an interesting museum dedicated to this old street. Its exposition is dedicated to the history of Andreevsky Spusk and contains pictures, photographs, engravings and other exhibits. Andreevsky Spusk is one of the places of gathering of Kiev bohemia: on the street there are many bars and cozy cafes where it is pleasant to spend an hour or two.